The security of the confidential information stored on computer systems is always crucial. Different security solutions are available on the market at the moment but Free CompuSec can be marked as the best option out there. This software encrypts entire hard disk including the operating system and other system files to secure the data from any unauthorized user. It has many powerful features that enable you to secure your machine and protects your data from other users of the machine. Let us have a brief look at what Free CompuSec can do for you. Despite such powerful and amazing features, CompuSec 64bit does not cost you anything. This software has been licenced as Freeware for the Windows (32bit and 64bit) operating system. This software is available for everyone as a free download. One of the best features of this software is the pre-boot authentication system. This system prevents all unauthorized users to gain access to computer information. This system prompts the user to enter a user id and a password to boot the operating system. The encrypted data will also be available only to the authenticated users. Enterprises can control CompuSec with GlobalAdmin central management system with great ease. In this system, one administrator has full control over the system. The admin has the authority to set policies of the system. The admin controls the access of all users to the computing machine. CompuSec offers e-identity management system to provide 2 or 3-factor authentication to add an extra layer of security. In this way, the users have to go through biometric verification procedure to gain access to the system. Also, they can be provided with a smart card or USB token to control the access. 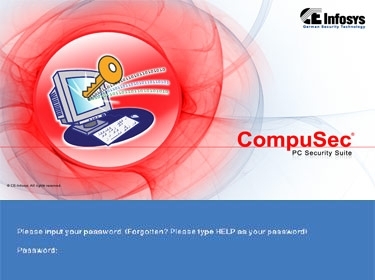 CompuSec also includes some other encryption tools including Removable Media Encryption ( for encrypting diskettes, CD, DVD and other removable media, SafeLan to encrypt individual files and folders on a system, ClosedTalk for encrypted VoIP through the internet, Container encryption with DriveCrypt and free online support is available at http:www.ce-infosys.comcei_forum. So download Free CompuSec 64bit and enjoy your work now!